cnes | COROT discovers its first exoplanet! Home> News and events> COROT discovers its first exoplanet! COROT discovers its first exoplanet! It’s called CoRoT-Exo-1b, spans a diameter of between 200,000 and 250,000 km and completes an orbit of its parent star in just 1½ days. But for the engineers and scientists involved in the COROT project, it is much more than that, providing spectacular proof that the satellite they spent years developing is operating like clockwork and is now set to go on to even greater things. - Transit of a planet (dip in brightness of the host star when the planet passes in front of it) as observed by COROT. The planet is a very hot giant planet orbiting its star in 1½ days and with an estimated radius of 1.5 to 1.8 times that of Jupiter. Thanks to combined spectroscopic observations from the ground, the mass of the planet has also been measured at around 1.3 times that of Jupiter. The parent star is a small Sun-like star. The newly discovered planet is what’s known in astronomy circles as a “hot Jupiter”, a gas giant that is overheated due to the proximity of its parent star. With a mass 1.3 times that of Jupiter, it orbits a star similar to our own Sun but is more than 1,500 light-years from Earth. COROT is not just an exoplanet hunter. It is also equipped to detect tiny oscillations on the surface of stars, akin to the bubbling on the surface of a saucepan of boiling water. 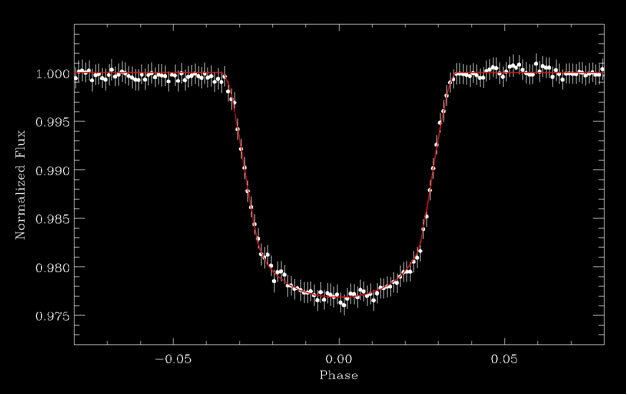 Light curve of an eclipsing binary, showing the reflected light between the two components, as observed by Corot. Studying these oscillations—a field that astronomers refer to as asteroseismology—provides clues about the processes going on inside a star. Relative light variations of a bright solar-type star observed continuously for 50 days. Measurement accuracy is the maximum attainable due to the quantum nature of light. Here, too, the 1st results from COROT are impressive: it has already studied a distant cousin of the Sun for 60 consecutive days to reveal surface oscillation modes that will enable scientists to determine its internal structure and age. Whether searching for exoplanets or probing stellar vibrations, COROT is already far exceeding scientists’ expectations and its 1st results augur well for a rich harvest of future discoveries.